Artists Ayodamola Okunseinde (left) and Salome Asega are creating a library of digital and physical artifacts that imagine the futures of people of African descent. BEDFORD-STUYVESANT — They’re going back to the future. Two Brooklyn-based artists are creating a library of digital and physical artifacts that imagine the futures of people of African descent. The Iyapo Repository, an archive comprised of designs brought to life by Salome Asega and Ayodamola Okunseinde, asks participants what they’d like to see in the world to come and creates narratives around their perspectives. “It’s getting people to come together to think about what the future could look like, what we hope it does not look like, and building technology around these different futures,” Asega said. The art project first stemmed from the idea that there was a lack of Africans or people of African descent in visions of the future, according to Okunseinde. Based on people’s sketches and prototypes during workshops, the artists will build the designs into functioning, working pieces. And many of them belong in a sci-fi movie — including a necklace that alerts wearers when there’s negative energy around. Asega and Okunseinde have also taken the conversation outside of their work space to neighborhoods in Brooklyn, asking everyday citizens for their ideas of the future. “I feel in the conversations that come up, a lot of people are definitely concerned with what’s happening now around Black Lives Matter, and that somehow finds its way into the work they make,” Asega said. 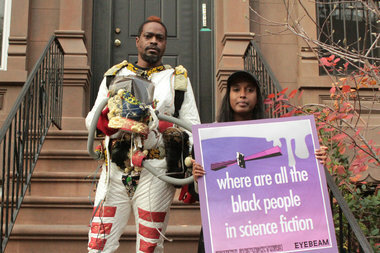 The project takes its name after the character Lilith Iyapo from science fiction author Octavia Butler, and is part of the artists’ residency with non-profit studio Eyebeam. After displaying the works at the end of spring, Asega and Okunseinde said they’d like to continue to expand the collection. “Each culture of Africa has different futures,” Okunseinde said.